Cat#: AA-043 Year: 1993 Price: $14. 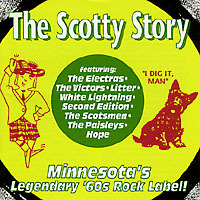 30 track retrospective of 4-star Minnesota label from the original mastertapes! Includes the Electras, Scotsmen, White Lightning, Litter plus lots of unreleased material! Comes with 24 page booklet packed full of photos and in-depth info. For anyone into '60s Punk, it doesn't get any better than this. You will need the RealAudio Player to hear these samples.